Earlier, Chome used to show a profile avatar icon on the top left. You could click on it and get a context menu for opening any other profile. But this option is now not available in the latest chrome version. Instead it now shows the current profile as a "name" button just aside the minimize icon. You could click on the name icon and use the "Switch user" menu to switch users, but is really inconvenient compared to the previous quick switch. 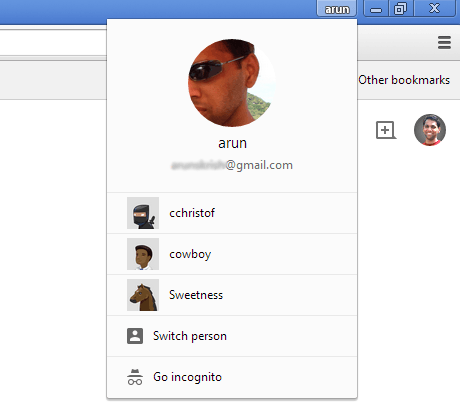 Get Back Quick User Switch Avatar Menu in Chrome. Chrome would open up the flags page and scroll to the "fast user switching" option. Click on the enable button to enable fast user switching. The flag will not take effect unless you do a restart. So close all open chrome windows and start chrome again. Now click on the name button and you will get a popup with all your chrome profiles listed along with associated avatar icons. Click on any and that profile will open in a new chrome window. Chrome now does not show a profile avatar icon on top left for quick profile switching. Here's how to get back the quick profile switch menu.